A ceiling fan that wobbles can be fixed with a few simple adjustments. This article will show you what to do when your ceiling fan wobbles. 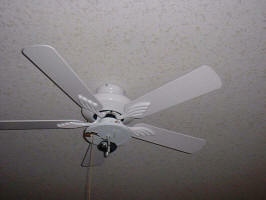 The ceiling fan blades should be inspected, and the use of a ceiling fan balancing kit may be necessary. I vividly remember a trip we took to Mexico one year. The hotel we booked did not have air conditioning. Instead, there was a monstrously large ceiling fan poised directly over the bed. When I turned the fan on and climbed into bed, it quickly became apparent that the fan was unbalanced. It whirled faster and faster, and with an amazing ‘bump and grind’ shaking routine. Sandy and I pulled the covers up in terror, as it almost seemed that the fan was going to fly off its mounting and kill us both as we lay there! This is an extreme example of what can happen when a fan is unbalanced. Your fan could be unbalanced because of a loose or bent blade. You will need to physically examine each blade and the structural integrity of your fan in order to determine if this is your problem. Or, you may need to purchase a balancing kit for your ceiling fan. Essentially, a balancing kit is made up of a clip and a selection of weights (as shown in the picture). Using the kit, it is becomes a ‘trial and error’ process to determine where your fan is unbalanced. The weight(s) (and clip) will be used to correct the imbalance. This entry was posted in Troubleshooting and tagged balance kit, bent blades, ceiling fan, ceiling fan blades, clips, fan, fan blades, loose fan blades, unbalanced ceiling fan, what to do when your ceiling fan wobbles, wobbling ceiling fan. Bookmark the permalink.